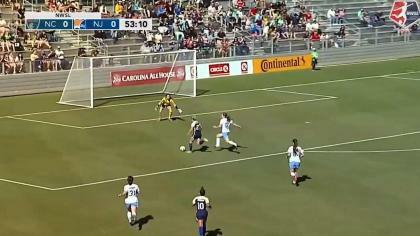 The Chicago Red Stars scored three goals in 15 minutes as they topped the North Carolina Courage 3-1 in front of 4,786 fans at Sahlen’s Stadium at WakeMed Soccer Park in Cary, North Carolina. It’s North Carolina’s second straight 3-1 loss, after starting the season 4-0-0. Red Stars forward Christen Press got Chicago on the board first, converting a penalty kick in the 30th minute for her second goal of the year. Press drew drew the foul to set up the PK after Courage goalkeeper Sabrina D’Angelo dove to stop an onrushing Press, but missed the ball and made contact with the striker in the penalty area. Midfielder Sofia Huerta scored a beautiful right-footed curling shot off an assist from Press in the 37th minute to make it 2-0, her first goal of the year. Midfielder Vanessa DiBernardo made it 3-0 in the 45th minute, collecting a loose ball in the box and sending it past D’Angelo. The score was DiBernardo’s first of 2017. Chicago goalkeeper Alyssa Naeher made four saves in the match, her best effort coming in the 58th minute as she pushed a quick shot from Debinha around the post and out of bounds. Forward Lynn Williams put North Carolina on the board in the 55th minute, her second tally of the season, but the Courage couldn’t pull any closer. DiBernardo left the match in the 69th minute with an apparent ankle injury. Courage forward Jessica McDonald, who recently broke the NWSL regular season scoring record, played the first half at right back. Courage defender Abby Erceg was suspended for the game after being red carded in last week’s loss to Orlando. Match ends, North Carolina Courage 1, Chicago Red Stars 3. Second Half ends, North Carolina Courage 1, Chicago Red Stars 3. Attempt missed. Samantha Mewis (North Carolina Courage) header from the centre of the box is too high. Assisted by Abby Dahlkemper with a cross following a corner. Offside, Chicago Red Stars. Taylor Comeau tries a through ball, but Summer Green is caught offside. Julie Ertz (Chicago Red Stars) is shown the yellow card. Substitution, Chicago Red Stars. Morgan Proffitt replaces Danielle Colaprico. Summer Green (Chicago Red Stars) wins a free kick on the right wing. Attempt saved. Christen Press (Chicago Red Stars) right footed shot from the centre of the box is saved in the centre of the goal. Assisted by Taylor Comeau. Attempt missed. Ashley Hatch (North Carolina Courage) right footed shot from outside the box misses to the left. Casey Short (Chicago Red Stars) is shown the yellow card for a bad foul. Attempt missed. Lynn Williams (North Carolina Courage) header from the centre of the box misses to the right. Assisted by Abby Dahlkemper with a cross following a corner. Attempt blocked. Jessica McDonald (North Carolina Courage) right footed shot from the centre of the box is blocked. Assisted by Lynn Williams. Attempt blocked. Ashley Hatch (North Carolina Courage) right footed shot from outside the box is blocked. Attempt saved. Ashley Hatch (North Carolina Courage) right footed shot from the left side of the box is saved in the centre of the goal. Assisted by Lynn Williams. Substitution, Chicago Red Stars. Taylor Comeau replaces Vanessa Di Bernardo because of an injury. Offside, Chicago Red Stars. Sofia Huerta tries a through ball, but Christen Press is caught offside. Attempt blocked. McCall Zerboni (North Carolina Courage) left footed shot from outside the box is blocked. Assisted by Yuri Kawamura. Jessica McDonald (North Carolina Courage) wins a free kick on the left wing. Attempt saved. Debinha (North Carolina Courage) right footed shot from outside the box is saved in the bottom right corner. Attempt blocked. Lynn Williams (North Carolina Courage) right footed shot from outside the box is blocked. Assisted by Jaelene Hinkle. Goal! 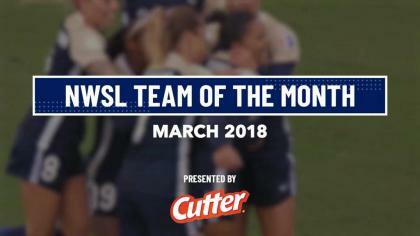 North Carolina Courage 1, Chicago Red Stars 3. Lynn Williams (North Carolina Courage) right footed shot from the centre of the box to the top right corner. Assisted by Jaelene Hinkle. Attempt blocked. Taylor Smith (North Carolina Courage) right footed shot from the right side of the box is blocked. Assisted by Lynn Williams. Second Half begins North Carolina Courage 0, Chicago Red Stars 3. Substitution, North Carolina Courage. Taylor Smith replaces Rosana. Substitution, North Carolina Courage. Ashley Hatch replaces Makenzy Doniak. First Half ends, North Carolina Courage 0, Chicago Red Stars 3. Goal! North Carolina Courage 0, Chicago Red Stars 3. Vanessa Di Bernardo (Chicago Red Stars) left footed shot from the centre of the box to the bottom left corner. Attempt saved. Alyssa Mautz (Chicago Red Stars) right footed shot from the right side of the box is saved in the bottom left corner. Assisted by Sofia Huerta with a cross. Corner, Chicago Red Stars. Conceded by Yuri Kawamura. Attempt blocked. Sofia Huerta (Chicago Red Stars) right footed shot from outside the box is blocked. Assisted by Alyssa Mautz. Vanessa Di Bernardo (Chicago Red Stars) hits the left post with a right footed shot from the centre of the box. Assisted by Julie Ertz. Goal! North Carolina Courage 0, Chicago Red Stars 2. Sofia Huerta (Chicago Red Stars) right footed shot from the left side of the box to the top right corner. Assisted by Christen Press. Attempt saved. Jaelene Hinkle (North Carolina Courage) left footed shot from outside the box is saved in the top right corner. Assisted by Makenzy Doniak with a cross. Rosana (North Carolina Courage) wins a free kick in the attacking half. Goal! North Carolina Courage 0, Chicago Red Stars 1. Christen Press (Chicago Red Stars) converts the penalty with a right footed shot to the bottom right corner. Penalty conceded by Sabrina D'Angelo (North Carolina Courage) after a foul in the penalty area. Penalty Chicago Red Stars. Christen Press draws a foul in the penalty area. Foul by Rosana (North Carolina Courage). Attempt saved. Sofia Huerta (Chicago Red Stars) right footed shot from the left side of the box is saved in the bottom left corner. Attempt missed. Alyssa Mautz (Chicago Red Stars) right footed shot from the left side of the box is close, but misses to the left. Offside, North Carolina Courage. Samantha Mewis tries a through ball, but Rosana is caught offside. Attempt saved. Sofia Huerta (Chicago Red Stars) right footed shot from the centre of the box is saved in the centre of the goal. Assisted by Christen Press with a through ball. Attempt saved. Rosana (North Carolina Courage) header from the centre of the box is saved in the top centre of the goal. Assisted by Abby Dahlkemper with a cross. Makenzy Doniak (North Carolina Courage) wins a free kick on the right wing. Attempt saved. Christen Press (Chicago Red Stars) right footed shot from outside the box is saved in the bottom right corner. Assisted by Sofia Huerta. Rosana (North Carolina Courage) wins a free kick in the defensive half.